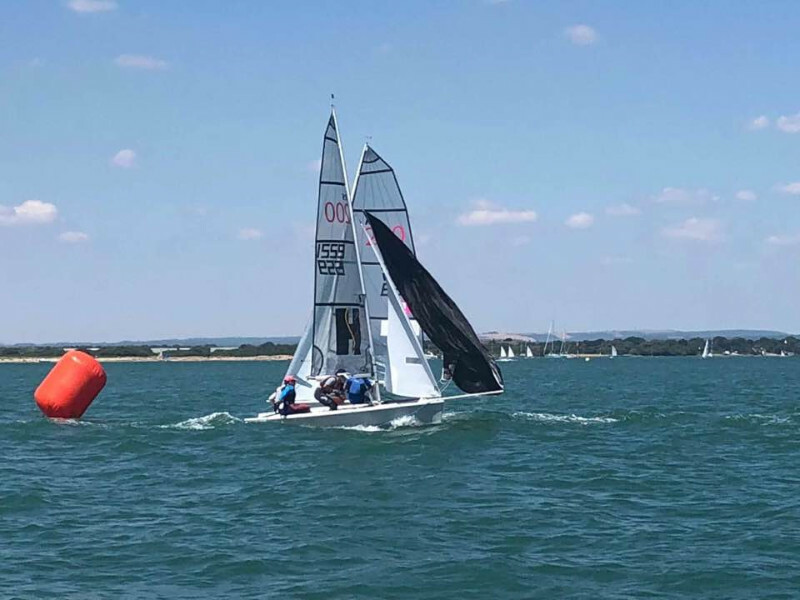 Last weekend, at Itchenor Sailing Club the beautiful weather and building sea breeze gave a wonderful two days of tight racing. Rule adherence at this event was very good, everyone responding to the new rule change and doing there turns when they hit the mark. The racing was brilliant, the first race of the weekend was kicked off with a win for Tom and Lucy Hewitson after a very tight battle with Matt and Emma Mee on the last lap. The second race was won by Owain Matthews and Rosie Sibthorp in a light winds race. The third won by Will Taylor and Madeline Watkins. The fourth won by Alistiar Norris and Helen Summersgill. The first day there were many black flags after the tide turned and was ripping out through the course. Itchenor hosted a great social on Saturday night with their legendary fish supper and bargain dark and stormies. The second day had more breeze, the sea breeze came in earlier, building through the afternoon to full on planing conditions by race 3 (oh those legs were getting tired towards the end of race 4!). Tight racing continued despite the social fun, one mistake and precious places were lost. The first race taken by Matt Shorrock and Jo Kalderon, over confindence lead to three OCS’s. The second race won by Owain Mattews and Rosie Sibthorp. In the third race a battle between the top three all the way around, second place swapping in the middle of the race after a long beat, but won by Olly Turner and Sam Mothershead. The last race won by the overall winners Matt and Emma Mee, picking some brilliant lay lines up the first beat. The Rooster endeavour prize was won by Kelvin Matthews and Kirsty Matthews. Overall second place went to Alistair Norris and Helen Summersgill, and third place went to Owain Matthews and Rosie Sibthorp. As always the racing was fast and furious, being very well run by the Itchenor race and safety teams.